Front lacing is adjusted by tying temporarily at waistline. Then lacing from bottom up to third hole from top ( see arrow). Loo and tuck in at sides. Women have been wearing them for about 4000 years but it’s less than 30 since they have had the painless variety. To most women, in recent times, wearing a corset meant nothing more that wiggling into a firm girdle, which kindly expanded and contracted with body movement. Such comfort has had to take a break. The WPB has stepped into the boudoir and 1. decreed the number of square inches of elastic which may be used and 2. banned zippers completely. (Arrows in the the image above by Life photographer Nina Leen, indicate legal elastic insets and hook-and-eye closure). Side lacing is begun at bottom, tied at top and tucked under at sides. Center arrows indicate two of three elastic inserts. 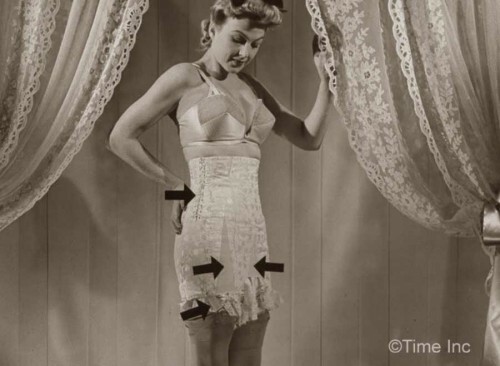 In all corsets, some elastic is needed around the hips so wear can sit down. When sitting, a woman spreads 2 to 3 inches. 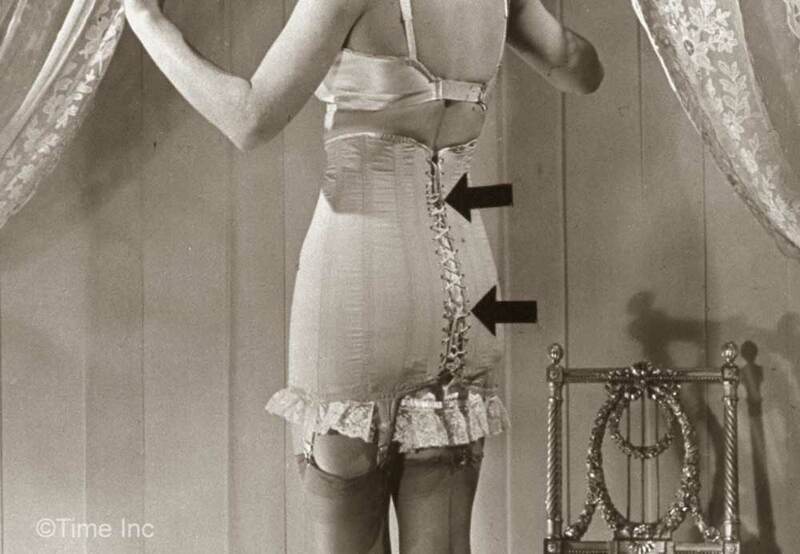 Bottom arrow points to side garter showing the correct angle for anchoring it to the stocking. The result is that the new corsets in wartime, instead of “stretching to fit,” will have to be designed and ‘laced’ to fit. Lacings, are a fine thing, according to New York’s Miss Francis Teller. They enable a woman to bind herself firmly where bulges are biggest, and shape remains as laced. Back lacing – is especially good for tall women with heavy thighs. arrows indicate how the lacing should be looped in two places, i.e near the top and near the bottom. In all laced corsets the garters should be fastened before the strings are tightened. The frills at bottom of corsets are not part of the garment but for decoration ! What Katie Did is our recommended purveyor of vintage inspired lingerie. Why not read our genuine foundation wear guide from 1948 with advice on what to get for your figure type.